Posted By PA Breast Cancer Coalition on October 20th, 2015 at 5:59 pm | 0 comments. PENNSYLVANIA – The American Cancer Society (ACS) today released new, weakened breast cancer screening guidelines, changing the recommended age for women to begin yearly mammograms to age 45 and every two years after age 55. Previously, the guidelines suggested annual mammograms beginning at age 40 for average risk women. Women should be able to start the screening as early as age 40, if they want to. It’s a good idea to start talking to your health care provider. 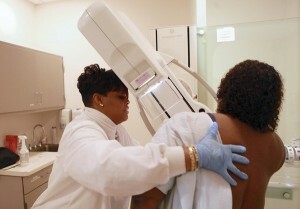 Regular mammograms should continue as long as a woman is in good health. The American Cancer Society bases its shift in suggested age and frequency on the occurrence of false positives/false alarms. The PA Breast Cancer Coalition (PBCC) cautions women in Pennsylvania on these latest, more confusing guidelines. Pennsylvania law requires insurers to cover the cost of all mammograms once a year for women beginning at age 40. Governor Tom Wolf, First Lady Frances Wolf and the PBCC announced earlier this month that 3D mammograms are covered under the same law for women insured in Pennsylvania effective immediately. Posted By PA Breast Cancer Coalition on October 19th, 2015 at 4:27 pm | 0 comments. The 2015 PA Breast Cancer Coalition Conference was one for the history books. Not only did we have a day focused on education, empowerment and advocacy, we welcomed major news from PA First Lady and PBCC Honorary Chair Frances Wolf. Mrs. Wolf announced that 3D mammograms are now required to be covered by the insurance companies for women in Pennsylvania. The 3D cutting-edge mammogram that was costing $60 to $600 for some insured women is now available at no cost. Big, BIG news! Pennsylvania is now the first state in nation to require coverage for 3D mammograms, effective now. The PA Breast Cancer Coalition would like to thank Governor Tom Wolf, First Lady Frances Wolf and Insurance Commissioner Teresa Miller for making this life-changing milestone possible for women in Pennsylvania! The Conference had other surprises in store for guests and awardees alike. We honored outstanding triple-negative breast cancer expert and researcher Dr. Edith Mitchell from the Sidney Kimmel Cancer Center at Jefferson University Hospitals with our prestigious Potamkin Prize. PA Rep. Matt Baker won a Pink Ribbon Award for his commitment to women’s health and our Breast Density Notification Act, and Dr. Wendie Berg of Magee-Womens Hospital of UPMC received a Pink Ribbon Award for her tremendous work on the issue of breast density. The PA Breast Cancer Coalition surprised Dr. Berg with a $50,000 Extraordinary Opportunity Grant to move forward with her research studying the accuracy of ultrasound vs. 3D mammograms for women with dense breasts. Those are only a few of the day’s highlights. We enjoyed spending the day with you! If you haven’t already done so, please take 2 minutes to fill out this survey to ensure next year’s Conference is even better. You will automatically be entered to win a PBCC prize pack! Thank you for participating in our historic 2015 PBCC Conference!